[Updated with video] Minister of Finance Bob Richards held his first press conference this afternoon [Jan 16], addressing the state of the island’s finances. The total revenue raised by the consolidated fund for fiscal 2011/12 was approximately $914.2 million, while current expenses were $1.246 billion. The all-inclusive results from government operations [both current and capital] for the year ending 2011/12, was a deficit of $343.2 million. “Ministries will be required to enhance their monthly reports of their expenditure versus budget allocations so that slippage can be arrested before they become problematic,” said the Minister. He said while keeping the OBA’s election promise not to lay off civil servants, Government will be commencing discussions with the relevant unions to identify strategies to reduce personnel costs throughout government. “46.8% of government expenses are related to employee compensation and benefits,” said Mr Richards. When asked whether pay cuts, salary reductions, and freezes are being considered, Minister Richards said it “is on the table.” When asked whether reduced work weeks are on the table, he said yes. Minister Richards said under the circumstances more borrowing will be required, and noted the debt ceiling will have to be raised. 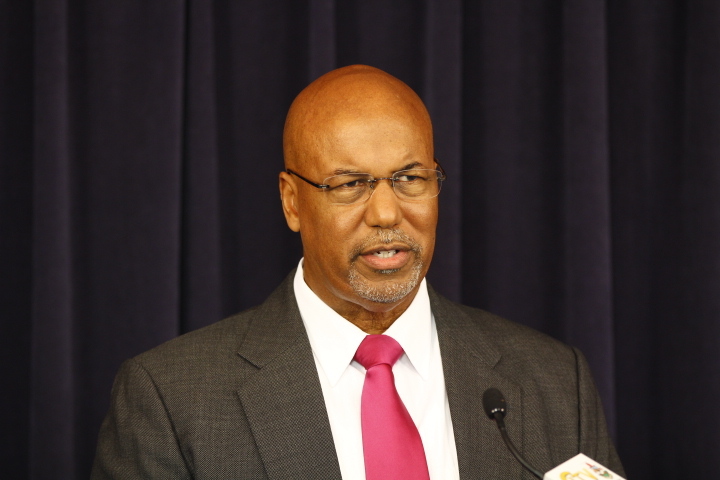 “This government is committed to changing the trajectory of deficits and debt going forward by implementing the measures just mentioned and others, however, in the meantime we have to keep the government running,” explained Minister Richards. “I regret to report that under these circumstances further borrowing will be required. Therefore, the legally binding debt ceiling will have to be raised during the upcoming budget session,” he said. When asked for details on the borrowing, the new Finance Minister said the number has not yet been set – but will be revealed on budget day. When asked, he would not comment on any possible tax increases. Minister Richards took over the Finance portfolio last month following the One Bermuda Alliance’s victory at the polls. The OBA Government’s approach to public finance is rooted in traditional values that a person should not live beyond his or her means. We believe our collective and individual success depends on our economic strength and financial independence, and that all decisions should be anchored to these fundamental goals. We want to ensure the people’s money is managed in ways that deliver important public services while building a secure, sustainable future for all our citizens. My job as Finance Minister is to help this process, to build and maintain a strong economy that grows opportunities that can help Bermudians pursue their dreams and provide for their families. This work must proceed in a transparent manner. We cannot succeed without the Bermudian people having the clearest understanding of the challenges we face and the goals we are working to achieve. To this end, I said late last year that I would report on the true state of government finances if I became Finance Minister – to report, in effect, what we found “under the hood” once we got into office. We are now nearly a month since the December 17th election and so today I would like to fulfill that pledge by providing a briefing on what we found, “under the hood” and on some of the implications that flow from those findings. Before doing so, I should point out that the previous government never released the audited financial statements for the year ending March 31, 2012, nor did it release a September 30th mid-year report on government finances. So we have some catching up to do. To avoid confusing or diminished meanings that sometimes happens when reporting numbers and data, I will limit myself to headline numbers and then focus on some of the initiatives this government will take to manage the situation. More detailed information will be provided to you in a handout at the end of this conference. The total revenue raised by the Consolidated Fund for fiscal 2011/12 was approximately $914.2 million, down $82.5 million (8.3%) from the previous year. Revenues were below the original budget estimates by approximately $25.9 million (2.7%) The weakening economy and the rollback of payroll tax rates were the principal reasons for the reduction. Current expenses for fiscal 2011/12 were $1.246 billion, down 2% on the previous year, a far smaller decrease than the decrease in revenues. The all-inclusive results from government operations (both current and capital) for the year ending 2011/12, was a deficit of $343.2 million. There are many non – cash expenses included in this figure. If we strip those away, the cash Current Account deficit (on the same basis that is shown in the Budget Book) was $169.9 million. Capital Expenditures for the year on a cash basis were $51.0 million. Therefore the combined cash based all inclusive deficit for the year ending March 31, 2012 was $220.9 million. Net Public Debt, which excludes guarantees and is net of the Sinking Fund, increased by $220.9 million to stand at $1.236 billion. This represents a 23.4% increase from fiscal 2010/11. Whether on a cash basis or an accrual basis the level of deficits mentioned above are not only unsustainable but economically and fiscally imprudent. In the 2012/13 National Budget the revenue target is $909.6 million; current expenditure target including debt service is $1 billion; capital expenditure is $76.1 million; with a borrowing requirement of $172.1 million (equal to the projected deficit). Revenues for the six months ending September 2012 were $412 million. This is $9 million lower than mid – 2011. Revenues are tracking approximately 4% below budget estimates. The reason for this slippage relates to weakness in the collection of Customs Duty. Considering the above, the Ministry of Finance estimates that revenue for the current fiscal year on a cash basis will be between $870 and $890 million. Mid- year Current Expenditures, excluding debt service, are $477.0 million; this is $3 million lower than last fiscal mid-year, but 1.7% above budget. Mid-year capital expenditures were $28 million, roughly the same as last fiscal mid-year. Total current and capital spending to date, excluding debt service, is $3 million lower than last year’s spend. On September 30th, 2012, Government total net debt, excluding guarantees, increased by $154.3 million in the first six months of the fiscal year to stand at $1.39 billion. So having “looked under the hood” it is clear that the state of government finances is every bit as bad as we had feared it might be when we were on the outside. The trajectories of deficits and debt we found are simply not sustainable. We cannot continue with debt rising at a rate of 23% per year. We can no longer tolerate the budget busting practices of the past. We cannot continue to use the global economy as an excuse for our own failures to properly manage the public purse. Major changes have to be made in the way we approach the handling of public money. More discipline must be enforced within government insofar as budgets are concerned. Going forward, budget allocations to ministries and departments will be ironclad. Ministries will be required to enhance their monthly reports of their expenditure versus budget allocations so that slippage can be arrested before they become problematic. Planning for the establishment of the Spending And Government Efficiency (SAGE) Commission is well under way and the members will be announced shortly. A Budget Implementation Group (BIG) will be established at the civil service level, headed up by the Financial Secretary, to ensure that members of the civil service are motivated to deliver on the mandates of the budget and the recommendations of the SAGE Commission. 46.8% of government expenses are related to employee compensation and benefits. While keeping our promise not to lay off any civil servants, the situation calls for shared sacrifice. Cabinet has led by example by taking a pay cut and we will be commencing discussions with the relevant unions to identify strategies to reduce personnel costs throughout government, including Quangos. We will establish a new set of rules, limits and targets that will govern government debt and expenditure. The inescapable reality is that Bermuda’s present economy cannot carry the government as it is presently structured and sized without implementing crippling tax increases. Your government does not want to go this route. Rather, we will focus our maximum efforts to streamline and deregulate the economy and implement the stimulus measures that we outlined in our Jobs & Economic Turnaround Plan. The immediate need is to grow the economy in ways that increase the amount of job-creating dollars in the economy and therefore revenues to government. This government is committed to changing the trajectory of deficits and debt going forward by implementing the measures just mentioned and others, however, in the meantime we have to keep the government running. We have to pay salaries. We have to provide services. We have to pay bills. The deficit and debt momentum has been building for years without check, and reducing them will take time, much as it takes time to stop a cruising supertanker. I regret to report that under these circumstances further borrowing will be required. Therefore, the legally binding debt ceiling will have to be raised during the upcoming budget session. A number has not yet been set, but it will be accompanied by new rules and plans to make it a meaningful ceiling, rather than a meaningless one that is ratcheted up every year. This, in summary, is the hand we have been dealt and, frankly, I believe it is one of the reasons we were elected – to bring responsible management to the public purse; to get the economy growing again so Bermudians can get back to work, and to put the Island on a stronger financial footing so we can better shape our national destiny. As we thought, the completely and totally incompetent PLP has run us into the ground. Thank God we had the sense to vote them out. Finally the honest truth. If the PLP were in power, they would be giving us spin and bs. The PLP were out of control, the public sensed it, and knew change was needed. It was EASY for PLP to make a mess of things, and party-hardy on borrowed funds. Ideally they should have cleaned it up, but that will have to be left for other responsible persons to do. uncle bob’s the new cog. Bob will NEVER be a Cog. We know who that was, and she’s been given the boot. Very sensible statement from Richards, honest, at times uncomfortable, but clear and professional. Its also clear the PLP sadly wasn’t just a bad dream, and we are going to pay for it for a while. Nothing is “free” – that word is just the polite way of saying that “someone else is paying for it”. Actually the only “freebie” (as mentioned nothing is free) in your list is transportation for school children and seniors. The day cale is an allowance of which the eligibility threshold was recently changed by the PLP as a means to cut back. The College “free” tuition was also scrapped by the previous administration. Hire some more consultants and continue NOT to tell us their terms or cost. Now we see the OBA promises fall apart and we see the deficit. Man are we in trouble. Consultants are probably a necessity to get us out of this hole and I’m sure this time they will be worth every penny and not a waste of money. I’m sure we’ll find out the cost soon enough. Early days yet only one month in. I think that such matters like the information in this article are more of a priority for the new government. Why should we depend on consultants.. That is BS.. You are elected/hired to do a job and if you cannot do it therefore you should be terminated or demoted. Forget this spoon feeding garbage. That comment shows a remarkable ignorance of how things actually work in the real world. If Bermuda had to issue bonds to raise capital, you wouldn’t expect your Finance to be savvy in that area. You need a consultant that has that kind of experience (KPMG, Goldman etc). …make sure the consultants have the expertise required…starting with Mr. Butterfield…please present his résumé and show us what expertise he has in Tourism!!! I thought that was David Dodwells job? He is a credible expert! Um jus saying…. R U FOR REAL! Zane was the minister of health …WTF did he know about that. Lets all get real here. So basically you all voted in the OBA to hire consultants to run the country. You are so on the money…why the hell does our premier need all of his appointed staff and consultants ? I am so glad that I did not vote for these loosers. I’d have thought someone called Webster would have known how to spell the word loser. it sound like no change to me richards is only doing exactly what cox was doing he proberly learned from her. how can he say cut wagss and work week and the other side of his mouth he is saying we are going to have more jobs. i think i like cox better. why cant people see the wool being pulled over their eyes. Didn’t Cox say we had to borrow more. So why is it bad when she says we have to borrow more but when bob richards says we have to borrow he blames it on Cox and thats OK. Like I said nothing has changed. Only change will come when independant candidates are voted in. huh… most consultants now are on contract from the previous government so far the OBA has hired what 4. Since the OBA is only a month in it is statistically impossible that they have more consultants hired under them than the PLP had unless you are counting the PLP’s consultants whom will serve out their contract due to it being very expensive to buy out their contracts and get no work done. There is a difference between consultants and Friends and Family that some called consultants with the sole intent of paying them money for their “support”. How is Bob going to go about reducing peoples pay that work for government?? Your going to meet with the BIU and BPSU and say that everyone is getting 20% less pay?? Yeah Right that’s not going to happen. There’s already no overtime in place in many departments across government what else can you cut? Or will you force early retirement for people older that 55 then put the stress on their children to pay their mortgage. All that sounds good on paper but it is impracticable and will not work. Set up this commission and that authority and what spend more $$ trying to fix the problem. The answer is… With great difficulty M3ke. Until recently our country used to be served just fine by 4,000 government employees, but for some reason the same population now has 6,000 government employees seeing to it’s needs. Perhaps you can explain how this explosion of salary expense happened over the last 5 years? So moojun are you outright admitting that the PLP created 2000 jobs? No. I am saying that they created 2,000 jobs in Government. Clearly this new staff came from positions in the private sector since our population hasn’t grown. Net benefit to Bermuda there was clearly no job creation. Quite the opposite in fact. But if you mean did they create 2,000 jobs that we the taxpayer clearly can’t afford to pay for? Then yes, yes I am. Trust me, this won’t end well, regardless of who is in power. Any town of similar size in North America would have a couple hundred Govenment workers at most, not thousands! 6,000 Civil Servants is ridiculous in the extreme. Sounds like we need 6 people to do one person’s work! 6 to 1, try going to TCD, Planning, Social Insurance or (heaven help you) the Dept of Immigration to get something done and be prepared to hurry up and get in line to wait for someone that won’t know what to do and will spend 5 minutes trying to call someone that does! That person is always in a meeting or on vacation and has a full mailbox. Ratio is more like 10 to 1 in many departments, but the worse part is that 8 of those 10 care are just there to collect paychecks while the other 2 do the actual work. No. Cox will always be the cog. What is exactly so funny about an administration who has not issued the 2012 year-end audited financials which apparently will show a $330+ million deficit for the year. The only thing remotely funny is the “handling” of OUR finances (i.e. taxpayer funds). And many will not find it funny when the new government has rectify the mess which the previous government has left behind. I really wish the PLP had retained power, because it is only right that they have to take the action required to restore our finances. OOH, can’t wait to see the budget.. I think we might feel it more than see it! With all that huff and puff during the campaign, you’d have thought Bermuda was broke. Ok Bob, now work you magic and reduce the debt while launching new programmes and not firing anyone. You mean we are not broke? Do people, institutions and/or Governments borrow and raise debt ceilings because we are flush with cash? You ARE broke when you spend out more than you take in….that’s primary school maths. When you owe $1.4bn and you’re spending $350m a year more than you’re taking in, what do you call that? Oh, I know. A “PLP Budget”. It was inevitable, but OUCH. That isn’t going to fix it. Thank you to all voters that elected the OBA, now we know the truth!! Seriously – - your personal attacks on Shadow Minister are unwarranted and unnecessary. I say this because if you did your fact checkig correctly, you would know that S Minister Burt’s company is not in receivership – - the company in question belongs and is managed soley by his father. Get a grip and discuss the statement from the Finance Minister – - stay on topic for once, OBA supporters. I think that piece of advice can be extended to bot sets of supporters. Don’t you? some oba were near receivership but godfather yearwood save them when the will was changed, so i heard,. Why haven’t the 2012 audited financials been released as of yet? Oh nevermind. I am assuming the $332 million deficit racked up by the previous administration during the 2011/12 fiscal year as being the reason why these have been hidden from the public. Can only imagine what the 2012/13 deficit will amount to. We will all wait to see how Minister Richards progresses with his new portfolio. My predection… blame the PLP for 2013 and 2014 and try for 2015 but at that point he has to accept the responsibility from his election promises. Thankfully the debt that is due in 2014 should be easy to pay off since there are funds in the sinking fund for that purpose. His discussions with the unions will also be interesting since they all agreed to the reduction for pension purposes except the Police. Note also that the payments for the hospital should start in the near future. We will all soon see that whoever is the Minister of Finance will have to work with the impact of the world economy to solve our fiscal challenges. What is the status of the sinking fund at this time? And in regards to your prediction in the first paragraph, the PLP blamed a Party that was out of power for 14 years for their actions and/or inactions. in my opinion… Bob Richardson , should have been our Premier. truth hurts, but it set you free! All those that voted for the PLP from the time they started running up the massive debt should be the ones to suffer. Those that voted for the UBP shouldn’t have to suffer because they saw what the PLP was doing. Wouldn’t it be nice if that could be done. That would make the voters responsible for the PLP Government created debt liable for it. What would that be? $50,000, $60,000 EACH liability? Could you just imagine!!!! Ya then the OBA can make all those people who voted for UBP and stole all that land from devils hole to Marriott, give the land back to the rightful owners. The truth is a small group of less than a dozen (yes white men) acquired land that built two golf courses and clubs, a major hotel that lasted sixty years, and all those mostly American owned houses in Tuckers Town – which apart from making us one of the first modern resorts set us on the road to unheard of prosperity and jobs for the country. It is begrudgers like you with a blinkered ethno-centric view of the past who are responsible for the mess that has been created these past fourteen years by allowing a bunch of crooks to manipulate your emotions. Apparently, all white folks have been expected to take the blame for this success ever since for this ignorant propagandist view. Yes, the land acquisition did indeed affect a few farming families (who I believe were paid off at market value) but has only benefitted the several generations of all Bermudans who found sound and good jobs as a result. Incidentally, the Bermuda Land Company, instrumental in all this, has always been American owned, mainly by the inheritors of Juan Trippe founder of PanAm. WTF??!!!! You are right, but also wrong. A lot of people were removed from their lands back then. I only know this because my family was one of them. And the reason why and who moved them was not who you say it was nor the reason why. And just so you know, the majority of those moved were not compensated either. A little peice of the truth for you: the banks called in all the loans of the black people at that time who were living in those prestigous areas and those who could not pay off their loans right then and there were removed from their homes. Now those who could pay it off were able to keep their house for a time until certain new residents who were racist urged them in a threatening manor to move somewhere else. Those who ended up moving because of the threats where compensated for their property, but way under market value of course. Dig a little deeper my firend to find the real truth. Its unfortunate that we have a divide in Bermuda. Our past is not good at all. Prior to the election I stated that all government departments needs to be look at very closely in over spending,shortening of the work day and week for as many of government employees. Then we have to take a very hard hit at the private sector who plays a major role in the cost of living in Bermuda,we complain about the cost of doing business in Bermuda.then this needs to be address from pay roll tax to importation fees. The rents on commercial business space in Bermuda is out in orbit and the prcies we pay for goods are a total rip off,considering most companies buy in bulk.so they need to give us a break in buying Bermuda. Food and accomadations in Bermuda,be it a rental unit or having a mortgage is the biggest joke when it comes to interest rates and affordability.so if Mr Richards has a magic wand that he can wave and reduce alot of the amounts that people pay to live in this country,then we can see us getting to the point that everyone gets a fare share of the pie when it comes to eliminating debt. I would urge that one has to work with the other because if you cut the work day and hours without addressing the cost of living in Bermuda,you will have more people needing to go to financial assistance for Governments help and that wont make any sense,so Mr Richards its no more time for sweet heart budgets, the wealthy have to be hit hard and then we will see some drastic changes that is long overdue. Dont keep protecting the deep pockets,the great Dr and others tried and look we are. Yeah you can start with the Gibbon’s run Bermuda Motors,, talking about being ripped off. The might as well come in my house nights and steal my wallett.. 300 – 400% mark up on goods is just criminal and it continues to occur. You don’t have to by a car from Bermuda Motors. In fact, if you think you can bring it in cheaper, than be my guest…or even open up your own dealership. Do yo realize the duty on a car is like 75% on the first 10,000 and 150% on the excess over 10,000. That means that a 10,000 car already costs 17,500 not including shipping, handling, wharfage, salaries and overhead. A 15,000 car costs 30,000 using the same calculations (that’s 15,000 in duty alone). No, the first 10k is free, after that the 75% duty kicks in. Also, a 50k car in Bermuda which really costs 25k or under but in most cases 20k and lower, would be a whole lot cheaper to bring in yourself. Do the math. there is no such thing as buying in bulk in Bermuda. The amount stat we buy and you consider bulk is nothing. B&V may buy 2 skids of ketchup at a time , Walmart will buy 20 – 40′ containers. That is bulk purchasing. Raise taxes Bob – there are no free lunches. Pay now or pay later. The PLP were like college kids getting multiple offers on free credit cards, and spending like they had no credit limits! And they were quite content on continuing also. Unbelievable. Thats a lie, if so why did Mr Richard make no mention of such action? Mr Richards mentions no indication of PLP sinster or mis-management of the government purse. The biggest cost of debt was the running of the government services CS, and OBA is faced with the very same issue. How will the OBA address it, most likely by cutting the CS which they promised not to do !! But the head count of the CS was increased 50% by the PLP without any corresponding increase in the Population or government revenues. How is that practicable? There is the mis-management: increasing salary expense with no means of paying for it. Just like a student who takes the credit card, knowing they have no means of repayment. I think it is time Minister Richards that you request a complete audit of ALL Government Departments over the past 8 yuears or so. In that audit I guarantee you that if it is done with a fine tooth brush you will find culprits that have collected consultancy funds and havent given the service or documentation to compliment the monies paid them. Friends hiring friends, former co-workers from former professions hiring one another under the disquise of a consultant. Bob you and Heather need to get moving on this research thoroughly. Dont leave NO department out. I know we are all Bermudians but forget the fact that some of these various Head of Departments may be close to you or friends of yours. Call a spade a spade. It is only professionalism that we the people rquest of you. OBA have their “Friends and Family” Plan in full action not. Look at who has been placed on all government boards, and as consultants. SO look in your own closet of the OBA, and you might see more than your willing to accept and admit. That’s Bermuda POLITICS for ya…. @tidbit. Why stop at 8yrs. Why not go back 30-40yrs. Or do you believe that the UBP was not capable to do the things that you outlined in your statement. Records over 15 years old would be extremely dificult to find… making prosecution of a defunct political party unlikely. Totally the opposite for the plp, though…. Reducing import tax to reduce retail prices and increase income tax would make perfect sense and balance tax collection based on income rather than spending. Reduced prices in shops and restaurants etc would also appeal to the tourists. The big question is how would this affect international business and attracting high flyers to our island? Given IB’s massive contribution to the economy it would seem that we’re stuck between a rock and a hard place and with CF ruling BIU there are some big nuts to crack. I always thought that the government would have to borrow more money wether it was OBA or PLP.I wish OBA the best in doing their part in turning our economy around. On another subject that I have my own opinion about, but I still have to ask ,there is so much work to do and they(OBA) couldn’t wait to get started why did the OBA choose to wait approximately 2 months to reconvene Parliament? Is it a strategy?Did they need this time to court elected opposition members?Is it set to be timed around the budget reading? Did the OBA have to use the 2 months time frame to check over all the necessary pre parliament work? Or are they waiting for results from the documents that where sent to others to be looked over? It would be nice to get the ball rolling as time waits for no one. As Minister, you don’t have to know everything, you have to have the vision and humility to lead the way. There are Bermudians who are hoping the OBA fail to fix our finances, simply to prove/make a political point. This is simply stupid and short sighted and clearly shows that many of them either don’t know or care that we are in this mess together. If the OBA can right the ship we all benefit, if not…………!!! Lets face it, IB are not going to start flooding back in simply because we have a new government. They were stung pretty badly by the previous regime. What confidence do they have that in five years time they won’t have to deal with the same misfits? They are going to need to see stability within government and our economy. The OBA are beginning with a blank slate, they have no history aside from personal business. As far as IB is concerned, they are an unknown quantity and in five years time they could be gone, so where does this leave IB? I believe we won’t see significant interest from IB unless the OBA are able to win a second election and show major improvements running our island business. They need to be assured that the mismanagement that created the mess we are in, will not return in five years time. Regaining their confidence is going to be very tough. Please tell me what the old Gov. done that was so bad to International Business? I swear I see more people complaining than the businesses themselves. The raising of the payroll tax, in the middle of a recession, without any consultation with any external stakeholder. Term limits are not the real reason, if you want to believe that, thats’s on you. The raising of payrolls tax. Was that increase 2%? So I am to believe that company’s making a couple hundred million quarterly left for a 2% increase in payroll tax? I wish I could believe you, but I honestly can’t. There has to be another reason. On a personal note, you do know big business is always looking for a new market to exploit, and they are only loyal to themselves. Several CEOs came out and announced their “schock, surprise and disappointment” at the raising of the payroll tax, especially since the Government did not consult with any external stakeholders (i.e. the people/organizations that would be affected by such a move). Why exactly do you think that the increase had to be rolled back one year later? Two words answers that – unintended consequences. Believe it or not, it is the truth. Actual increase 14%. You obviously don’t speak to people that work in IB. They would give you their honest opinions. Mr. Richard is running from the truth, and failed to address key issues in his press conference. He used obscure words to place it on the feet of the PLP, forgetting that the OBA is now the government, and must address the current issues. Stop listening to the “Sound-Bites” of Mr. Richards, and listen to the underlying message. He is attempting to spin it like the PLP ran up debt, but in fact the OBA is faced with the very same problem. How to maintain the biggest cost to government, which is the running of government services, which includes the Civil Servants. Bob is attempting to win favor by suggesting something is under the “Hood: but in fact he did not find anything unusual, sinister or any form of mis-management by the PLP government. Do not fall for his spin on words, to attempt to bury his answers to the OBA fans, as to how he will address the debt and get the government running. Read behind the Sound-Bites, for a change. The OBA will do no better than the PLP to turn the economy around, if the world economy does not change. That is just the hard reality of the matter regarding debt. The PLP government biggest debt was payment of government services. The OBA government’s biggest debt is payment of government services. How do they achieve their election promises without disappointing the many they promised? That is what he failed to address, but he did a good job of spinning his way out of addressing and answering the real questions. PLP kept the government services afloat, at a huge debt, the OBA will do the same, by borrowing, and the OBA is doing nothing different. So do not let them attempt to twist this issue around as if the PLP was not on track with government spending. Wait and see how Bob answers your most pressing questions. So far the OBA has failed to address it with workable solutions. Spot on because of the jerks that destroyed the economic viability of this country over fourteen years – we cannot expect miracles. The mismanagement of OUR Country’s finances falls squarely at the feet of the plp… particularly Dr Evil and the Cog. There is no getting away from the truth no matter how you attempt to spin it! This is true, but constantly complaining about it will not fix the problem. Only action will suffice here. There is no need to still play the blame game. OBA won! No need to stay in election mode, its time to get into running the country mode! @ ABM: Most of us would love to get out of election mode, but there are some die-hards on both sides – those who are still angry about our current fiscal crisis, and those who are trying to persuade themselves and others that (a) there really isn’t a financial crisis, Mr. Richards is just belly-aching; (b)if there really IS a financial crisis, it is not the PLP’s fault ; and/or (c)the OBA need to just shut up and fix it (although they don’t really believe there’s a problem, see (b)). As I said before the OBA is a conservative government, they believe in Austerity, and Mr. Richards will follow that line of action, at the expense of losing great support in the future. many fell for this during the election, and failed to ask the OBA hard questions about how they would acheive their overall goals. Now they are uncomfortable and feel like they voted blindly. But, since many believe he has all the answers, they will also fall on their swords in the end. But “Bring it on”!! ONE BILLION ANSWERS BEFORE THE ELECTIONS … NO RESULTS AFTER . BOB THE SMOG COG . Do you people have nothing better to do than spend your time sniping at people? How long have the OBA been in office… 5 minutes? For God’s sake, will you grow up and make a contribution for a change… taking pot-shots is for sissies! you just want them to fail! If they fail, Bermuda Fails! Our former government put us in this mess, and you just won’t admit this because your so hung up on party and not Bermuda. No matter what happens, cut in pay or cut in jobs it has to happen because of the mismanagement of the previous administration. Thanks to our beloved PLP, our country is in trouble for many years to come, $233,000 per day to service interest on the debt!!!!!!!!!!!!! How did we get to this point…..PLP administration through your vote!! @staying focus? Why are you writing under that pen name, you are obviously the same person who writes under the name Betty Trump on the RG?! I am a conservative and I believe that the books should balance at the end of the day, and yes either taxes should be raised or the govt is cut in size, or a combination of the two! It’s as simple as that. I’m sure there are quite a few others. Net result, Government not only gets rid of the cost but also gets a revenue stream by putting these services up for tender every few years. Go ahead Bob and show us that you have what it takes. Privatizing Government services like public transport, garbage collection, road maintenance & such will not earn Government money but by being privately run they will cost far less money & still earn a decent return for the companies running those services. First to go will be most of the office staff who spend their days in ‘meetings’ or surfing the net. Next to go will be crews on the ferrys & trash trucks where anywhere else the equipment is operated with fewer people. With a voucher system for private schools the Dep of Education would virtually disappear. What are all those people doing in there anyway? The most expensive private school currently costs something like $4000 per student LESS per year than public schools. I subscribe to the privatization of some government services but lets keep in mind the private sector is the first to jump on the layoff bandwagon. Although the private sector can be more efficient, does this create added benefit to the everyday citizen in terms of job opportunities or would this merely be just a shift of jobs from the public sector to the private sector. was possibly stolen ,went missing mishandled,and wasted by 14 years of the PLP.- this way he could see the path that lay front of him and could avoid making some of the same blunders. Where is the Accountant General and what is her status with the Gov’t.? Why was she put on Admin leave? I can be patient about the unfolding of the new gov’t., but this question needs to be addressed sooner rather than later. The PLP have put Bermuda in its perilous state. Now the OBA has to do unpopular things to help revive us,as the former govt officials laugh all the way to the bank.Life is so unfair at times.Let us hope the PLP never control the govt again,all will be lost! Bob, if you cut my pay, we will be forced to leave BErmuda. My highly qualified and blacklisted spouse (who sued his employer for wrongful dismissal and won) has been unemployed since the lawsuit, which coincided with the economic downturn. My Government salary is the only one coming into our house. You want to penalize me for working hard and doing my job, as a Bermudian? Our finances cannot withstand a paycut. Until my spouse is working again, our single income household won’t survive here on a reduced salary. Please give this more thought before you act. And let me tell you, leaving Bermuda will mean moving in with my spouse’s parents, hoping they can float us until we find jobs. What you need to address is the croneyism and friends and family deals that have sucked the life out of all of us, and don’t perpetuate it. There are at least five high-level senior civil servants I can think of who need to go. That’s a million right there. I guess I’d better start packing. Who would have thought that my own country would be an impossible place to live. If only Jeff – take a look at Civil Service salaries. One of the reasons there are so many “consultants” (by the way, the definition of consultant in government is totally wrong, they use it to define construction contractors, temporary staff and interim staff – wholly inaccurately!) is that the Civil Service pays so little that they can’t attract staff. One good example is Accountants. A Ministry Comptroller in Government earns just about the same as a Management Accountant in the Insurance Industry whilst taking on massive amounts more in responsibility terms. Civil Servants earning a fortune is a complete myth – take it from me, I am one! I’m not sure what ivory castle you think I’m living in, Jeff. My spouse can’t even get a job digging ditches because no one wants to hire the smart guy. I’m thankful for my job, and that we’re meeting all of our financial obligations, but it’s fragile. Haven’t had a vacation off-island in two years. Wore the tires down on the car because we couldn’t afford new ones until now. Haven’t bought my son any ‘new’ clothes, we shop at thrift shops. We go out to dinner once a year- for our anniversary. We don’t buy takeout food, I brown-bag it every day, and we buy the ‘store’ brand of just about everything. I make just about everything from scratch. We only have one phone for all three of us- and it’s a mobile phone. We don’t have data on it, and we don’t even have a land line. I don’t get my hair done, I trim my family’s hair (at least they’re guys so buzz cuts are okay!) We’ve all but given up on the dream of owning our own home, because there isn’t much of anything left at the end of every month. I don’t see where we could do with 20% less of my salary, unless BELCO will take 20% off my bills, my landlord takes 20% off my rent, my son’s school agrees to take 20% less in fees, and groceries, gas and insurance all of a sudden take 20% off. I hardly think that qualifies as an ‘ivory castle’ lifestyle, and if it does, then maybe you’re right- we do need to live somewhere else. We are hurting too. Just because we personally still have jobs, that doesn’t mean we don’t have families to support and bills to pay. Fed-up, I too am a Government worker and I agree with everything you say. There are some of us who work our a** off and there are those – at all levels – who do next to nothing. The friends and family need to get lost and leave us who want to work – and by the way are capable of doing our jobs – to get on with running things. I’d love to know why the National School of Governments recommendations into which Permanent Secretaries were capable and which should be fired never saw the light of day (done in summer 2012)?? Maybe there were certain PS’s who were on that F&F deal? Or maybe the Cabinet Secretary doesn’t have the testicular fortitude to do his damn job right? That’s the questions this new Government need answers to! I’d rather take my chance at proving I am worth every penny of my salary by competing for my own job, that to accept a wage cut just so I can go on subsidizing lazy and incompetent people. Of course the other point of that is – if you upset the Civil Servants, they will look for other jobs. Only those that are really, really good will be able to find other jobs, and then the CS is left with the rubbish who are unemployable elsewhere. It happened in the UK and it will happen here. I’m so with you there. You said it all. And use the money raised for schools and debt pay down. Cap the winner(s) at 2mill 2-5 bucks a chance at 2mill……..
as far as Im concerned its some of the civil servants that need to be cut!.. Some just arent pulling their weight. Day Care, Free bus and ferry, Free license for seniors, free Bermuda College how did you expect the govt to pay for this. At least they gave us something. The UPB and OBA will never give us social programs. That’s the reason why the UPb/OBA had a surplus is because they gave us NO social programs. Go back and check people. And guess what, OBA are going to take them all away. You need to take up the free Bda College offer if you can see that all these things are not sastainable. That free BDA college tuition was scrapped years back now. Free bus and ferry are only for certain segments of the population while the day car ALLOWANCE (never free like promised) recently had the eligibility threshold reduced even further. If you think that these so called “freebies” are actually free then you are more brainwashed too be fixed. Nothing is free and taxes were raised by the PLP to pay for these “freebies” which in turn increases the already sky high living costs in this island.